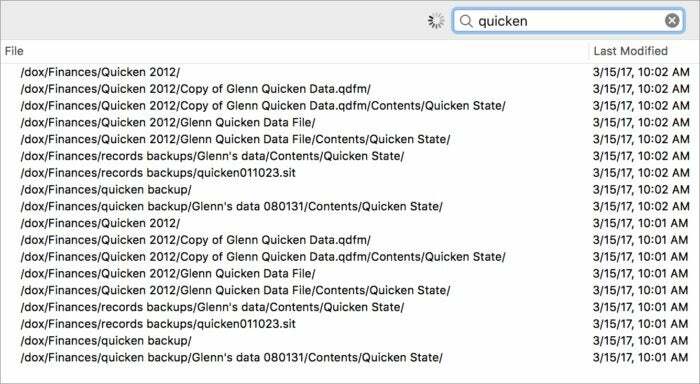 There have never been so many options to clone, backup, and archive data from your Mac. And there have never been so few options for local networked backup. With Apple’s Time Machine and Time Capsule eating the heart out of the basic backup market for connected and networked archives, and several competing cloud-hosted services owning flat-rate unlimited storage, it’s hard for any developer to compete. Code42’s CrashPlan and Econ Technologies’ ChronoSync are players in the game. CrashPlan offers a single software client that can copy data to a connected volume, a LAN-hosted volume, a friend’s Internet-reachable drive, or its own for-fee cloud service that has an unlimited storage option. ChronoSync is a ridiculously full-featured clone, mirror, and sync package that works with local and network-mounted drives (including Network Attached Storage (NAS) devices), and also with Amazon S3 (Simple Storage Service) and Google Cloud Storage, as well as via SFTP (Secure FTP). However, CrashPlan’s home flavor relies on Java after promises years ago to migrate to native software as the firm has done for its business customers. The software is funky and inconsistent, as I’ve found on two different Macs (though it runs fine on others in my family’s network). And it uses a proprietary format for archiving. ChronoSync is a fantastic option, but so deeply and comprehensively fleshed out, I’m afraid that it requires a relatively high amount of sophistication to use it well. I’ve spent many hours with it and have mastered it, but it’s too high a burden for more casual users. This is where Arq comes in—and stands out. The affordably priced backup software ($50) is native, more reliable and easier to use than CrashPlan, more focused on backups and simpler than ChronoSync, and has a unique twist: it can back up data to Amazon’s consumer-focused Amazon Cloud Drive service. Amazon’s data hosting costs a flat $60 a year for unlimited storage, making it competitive with Backblaze, CrashPlan, and other hosted services. Arq can also back up to Dropbox, Google Drive, and OneDrive, which some people may already be paying for, and which don’t charge for moving data in and out. While ChronoSync can archive to cloud services, it currently works only with those that charge for data transferred and data stored. Arq is closest to Backblaze, or even Apple’s long-ago Backups app, in terms of reducing complexity and focusing on documents. For straightforward backups with a history of revisions, Arq requires just selecting folders and one or more destinations. You can dig in a little deeper to exclude certain directories or kinds of files or customize a backup schedule and other parameters by destination. I’d say Time Machine is even simpler, but Time Machine offers effectively no options, and Apple’s built-in archiver is meant to offer a complete restoration of a disk as well as the ability to select older versions of modified files. Arq is not a cloner: you’ll want to use Time Machine, SuperDuper, Carbon Carbon Cloner, or the cloning mode in ChronoSync for that purpose. Set up a backup destination (see “Choose backup destinations,” below). Choose a password that you carefully store somewhere (more on that in “Encryption,” below). Agree to a prompt to back up your Home folder. It then just runs hourly indefinitely. Arq stores incremental backups, uploading only changed chunks of files, and can restore by reassembling pieces across time that relate to the version you want. This is a common strategy. You can change the interval and times of day when a backup runs or set it to run only on a manual request. You aren’t limited to your Home folder: you can backup any folder you select, although because of its approach in backing up, I’d recommend avoiding system files, which is true of many backup programs that don’t perform a full clone operation. When it adds your Home folder, Arq excludes the same files and locations as Time Machine. But you can configure your own exclusions by unchecking files and folders in a browser list. You can also use one or more matching conditions for file/folder names as well regular expressions used on the full file path. As you add folders by destination, they appear in a simple list at left under Configure Backups. Beneath that, there’s a corresponding set of entries for Restore Files. Each backup appears under a folder for both Configure and Restore showing the backup dates. 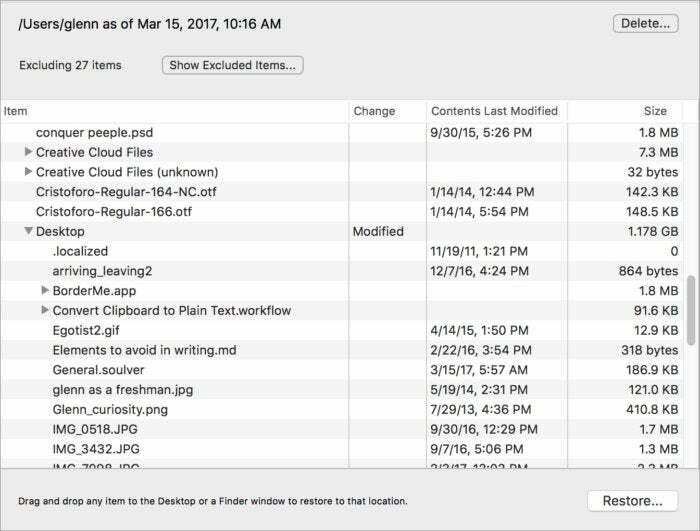 Restoring files is a little chunkier than backing up, and more sophisticated software often has better options to assemble a set of items to retrieve. With Arq, you either drill down through a source to a folder to a given date-and-time backup, and then browse a folder and file hierarchy, or you can search across all backups. In search results, Arq only shows a file path, like /Users/Home/billg/Documents/dog1.jpg instead of a more friendly icon-based hierarchy, and it doesn’t reveal from which backup each file or folder comes in the list. Browsing backups works better than searching for files, but you can’t make multiple selections, among other awkwardness. If you browse through a given backup set from a destination, Arq labels folders and files changed, added, or deleted since the last backup, and labels all files with the last modified date, whether they were modified or not. However, when you search, the only information shows is the date and time of the backup of which the result is part, and the backup source isn’t identified, either. This is sub-par. The search results for checking backups doesn’t provide enough information to choose among different versions. While Arq’s selection options are frankly just about as clunky and frustrating as most other backup client software, its biggest flaw is that you can only select one file or folder at a time, either for dragging to the Finder (where it restores in the place you dragged) or using the Restore button, which offers to overwrite or restore into a separate folder in the original location from which files were backed up. The overwrite dialog for restoring files doesn’t fully explain all the outcomes. Even that overwrite/write-alongside option is confusing: the dialog offers Do Not Overwrite, Cancel, and Overwrite, while the text explains that Arq is “downloading and replacing only the modified and missing files with the files from the backup.” That’s only true with Overwrite; click Do Not Overwrite, and Arq puts the entire selection in a folder in that nested location. This is good behavior, but explained poorly. Arq desperately needs multiple selections and non-contiguous ones, as well as other ways to retrieve files besides dragging and overwriting. Other software and services have varying approaches that make it easier to get to the right place at the right time. It’s primarily for a failure to have richer and more robust restore options that I gave Arq four mice instead of five. Beyond simplicity, Arq’s best point is supporting so many different kinds of backup destinations. As noted at the outset, it works with conventional cloud-storage offerings, Amazon S3 and Google Cloud Storage, which effectively charge for data transfer and then lease you storage on a per-gigabyte monthly pro-rated basis. But Arq also connects with Amazon Cloud Drive (unlimited storage for $60 a year), paid tiers of Dropbox (1TB, 2TB, and unlimited flavors from $8.25 to $20 per month), Google Drive (1TB for $10 a month), and Microsoft OneDrive (1TB for $6 a month). Many people through work or for personal use already have a cloud subscription, and Arq lets you leverage what you’re already paying instead of adding another monthly or yearly fee on top. Arq can also connect to any server that supports SFTP (Secure FTP), a long-available secured file-transfer protocol built on top of SSH (Secure Shell) for remote server access. It’s part of macOS’s Remote Access service in the Sharing system preference pane. 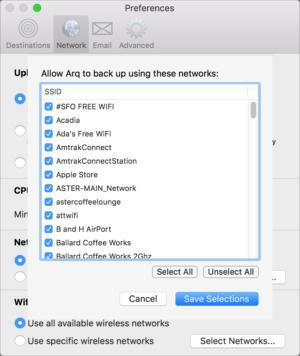 And Arq can back up to any folder or volume you can select through a standard dialog box, which includes NAS devices and other Macs over AFP or SMB. This diversity of options and the ability to work with Amazon Cloud Drive puts Arq above the pack. While many hosted backup services cost between $4 to $6 month per computer for unlimited storage, they control all remote access to your files, and all of them only back up to their own data stores. Arq provides access and cost insight into usage-based cloud-storage options. Arq has some nice subtleties in how you work with destination cloud services, letting you choose among different tiers of Amazon and Google’s usage-based storage services that are priced based on how frequently you might need to retrieve the data. Arq puts a friendly interface particularly in front of Amazon Glacier, an appropriately named “cold storage” service that’s meant for essentially long-term reliable storage of data you may never need to retrieve. Retrieval costs with Glacier vary, too, and Arq lets you select among three options. Every destination can have settings for frequency and time of day set, as well as a data or cost budget and thinning interval. And in what is a fantastic option for managing storage limits and costs, you can set a backup budget in storage size or cost: Arq will cull pieces of files related to older versions when you exceed the budget, but will also ensure it has one complete backup, even if it goes over that total. 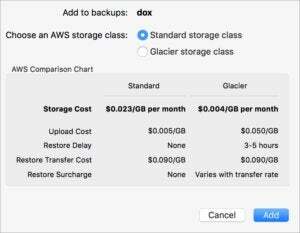 The monetary cost appears for backup methods that charge in units and for which Arq can calculate storage costs; otherwise, you see storage a limit. You can set an interval during which to enforce the budget and perform a manual cull. A common scenario is when you have large files that you modify frequently enough and that use a data storage format that ripples changes throughout. A 100MB file could balloon to occupy tens of gigabytes or more over time if you don’t cull past versions. 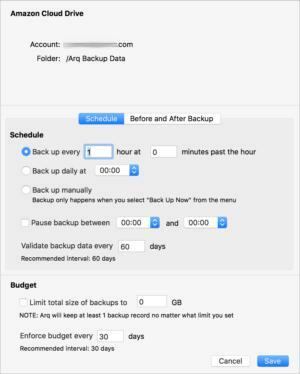 You can also set a global preference in Arq > Preferences > Advanced labeled “Thin backups from hourly to daily to weekly.” On each backup, Arq retains no more than one backup per week per file, one month worth of daily backups, and one day of hourly backups. With a budget enabled, that culling also happens in reverse order from weekly to daily to hourly to stay within the budget. Arq can avoid backing up to certain Wi-Fi networks (and certain network interfaces, not shown). Arq’s one flaw in backup locations is that it doesn’t store credentials (all the login information) separately from destinations. If you’re using different kinds of storage at Amazon S3 or Google Cloud Storage, or different folders for SFTP, you have to go through the login process each time. That could be simplified with a credentials manager, used by file-transfer software like Transmit and Arq quasi-competitor ChronoSync. I suspect, however, most Arq users aren’t using lots of locations at the same service. And the pain is one time: once set up, you don’t have to repeat it. All data is encrypted by Arq before it leaves your computer or before it’s stored locally in a folder using standard encryption elements, similar to the git version-control system. (You can read the full details.) It seems well conceived to me. You pick a passphrase each time you start using a destination. The passphrase can be identical across all your destinations or re-used across some or all. The app generates random keys for encryption for each destination, and then encrypts those keys using your passphrase, which is transformed through an algorithm into an encryption key. That encrypted file with the destination keys is stored with the backup. You set your own passphrase for each destination’s encryption keys.